When you have invested much time, talent and energy into a new invention, it is advisable to protect it with a patent. A provisional patent provides a low-cost alternative to begin the patenting process on a new invention. With an approved provisional patent, you can begin manufacturing and marketing a product as "patent pending", and have some protection over the invention. A provisional patent application requires you to make a written description, and provide drawings which will support the subject matter to be claimed in the later non-provisional application. It is important that the written description disclose the full scope of the invention, as the non-provisional patent can only be made based on common subject matter with the provisional patent application. For this reason, it is very important that your provisional patent describes the invention thoroughly. Legal advice is essential, but in order to describe your invention fully you may have to write much of the written description yourself. To make sure that important details are not misconstrued due to errors in your English writing, use WhiteSmoke. WhiteSmoke Writing Software will bring an extra level of professionalism to your patent, and ensure it communicates exactly what you want to say. As an all-in-one solution, WhiteSmoke features a grammar checker, a spell checker, a thesaurus-dictionary, and special enrichment features to make your legal documents stand out. Keeping these points in mind, you can begin to write your patent application. Protect your invention properly by using WhiteSmoke's online proofreading tool. 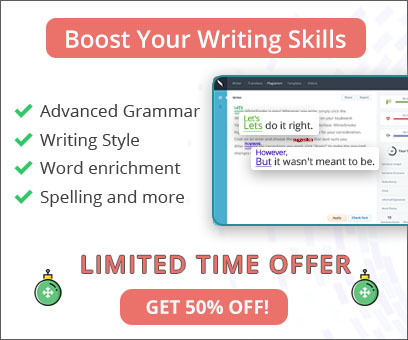 Other grammar programs do basic checks, but WhiteSmoke is an all-in-one grammar check software, spell check software, and a tool for unique text enrichment. 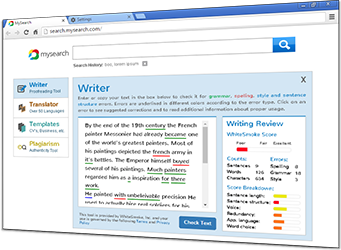 Artificial Intelligence Technology powers WhiteSmoke's grammar algorithms, and a proprietary dictionary-thesaurus gives you any word you could possibly need with just a single mouse-click. The specialized legal version will make sure your patent application contains the right legal jargon, and other dedicated versions for business writing, creative writing, and medical writing shape your writing to the requirements of those fields.